Skydiving Reviews from our recent clients. 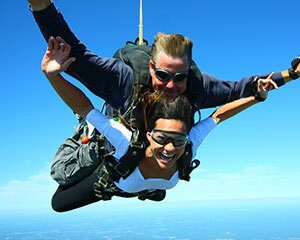 See why so many chose to jump with Skydive Cross Keys in Williamstown, NJ. After many years of wanting to jump I finally did it at Cross Keys. Staff was awesome, very knowledgeable, answered all questions and moved everyone along quickly and smoothly with laughs along the way. I jumped with Peter and he was awesome!!! I couldn't have felt safer and more at ease then I did, for the first time. Would jump with him again any day! Got the picture/video package. So happy I did, they did an amazing job and it's a memory I will always have. Thank you Cross Keys for an amazing experience! Will see you again in the spring!!!! Wanted to find something better than roller coasters and I did! This was my first jump and it was amazing. The instructors were very pumped and engaging. They explained everything and showed common landmarks while coming down. I was lucky enough to have them help with my marriage proposal! They took pictures and everything for us- I recommend to anyone and everyone regardless if it's your first time. Can't wait to go back. Thank you guys for everything! 5 stars isn't a good enough rating for this place! Three days ago I had the most amazing experience of my first jump ever...and loved it!! Can't stop thinking about it and want to do it again! Everyone was awesome at Skydive Cross Keys and made me feel at home. My instructor Matt was super awesome and made my experience even better with memories I'll have forever! Thank you Matt and SCK! Just want to add that the videographer was awesome too...got great shots and amazing video. Definitely recommend for a first jump! Absolutely recommend this place to anyone thinking of skydiving. Very friendly and professional staff, that makes you feel comfortable at every stage. I wasn't nervous the whole time, probably knowing that I am in good hands. The videos and photos came out pretty good, almost like a Tom Cruise movie.. 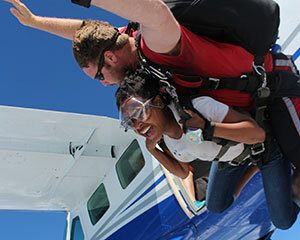 Thanks Skydive Cross Keys for making my 1st skydiving experience awesome! I loved every minute! A special thanks to Matt Vasapollo for taking the time to answer all my questions. A big thanks to John Szabo for providing me with beautiful and professional video & pictures. A very special thank you to Dave Pancake for a memorable & unique experience! Much Love-Peace-Joy! Shout out to everyone at Cross Keys for making my first jump amazing! Mike V - I couldn't have asked for a better tandem instructor - you were professional, fun, and you made the jump the safest you could possibly make it. Your expertise and positive, honest approach were all I needed to take advantage of this jump. Art - the pics and video are fantastic! Showing them off just adds to the excitement of working my friends and family about the experience. Cross Keys is the BEST! Yesterday was my first time skydiving and it won't be my last! Range and Matt V. we're awesome. I had not an ounce of fear because I knew I would be in good hands. I will most certainly be back! Thank you guys. P.S. Get it videoed. It's so worth it. My photographer was phenomenal. I had an awesome first jump here at the Skydive Cross Keys. Staff was wonderful. Special shot out to my sky diving instructor Mr.Pancake and videographer Zabo for making this jump the best thrill yet. I see the bright blue sky in another light now. Falling through the white clouds was unimaginable. Thanking everyone who made this possible for me. I highly recommend everyone to try it out at least one time.